It's Grand Final time people! We get to watch the two best teams go at it this weekend, when the Bulldogs face the Storm, and pass on commiserations to the other 14 teams for being practically useless in 2012. The whole NOT The Footy Show gang has their intricate predictions for the big one below or on the Podcast - which if you've never listened to I suggest you give it a go this week, as it could be the last one we ever do. Dogs were favourites until the bookies saw what Melbourne did to Manly in the prelim final. But really the Dogs shouldn't be far out of even money status as they match up well with the Storm. 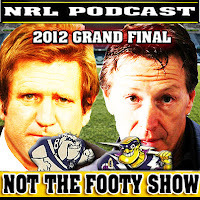 If you want to hear who the NOT The Footy Show team likes for between the Bulldogs and Storm in Sunday's Grand Final - grab yourself our 2 hour NRL Grand Final Podcast (right click/save target as). After Week 3 - Well the one team that's had Canberra's number this season is... you guessed it - the Wests Tigers. This Grand Final will be decided by whoever defends for the longest, because both teams can attack with the best of them - and that's why they are here on Grand Final Day. 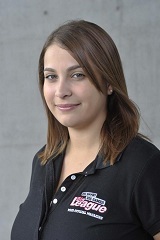 Kick-off is at 2pm at ANZ Stadium and we like the Raiders by 8 points. Canberra's Edrick Lee, Mitch Cornish and Anthony Milford hold the key. 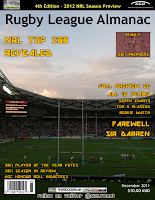 Now there will be a Man of the Match Award voted on Twitter for the NYC Grand Final (#NYCGF) - follow #NRLTweetPlayerofSeptember during the coverage, as we vote on the #NRLGF, NYC and #VBNSWCupGF throughout the day. 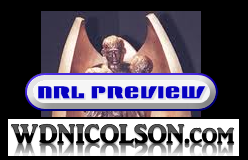 In the NSW Cup Grand Final - the Newtown Jets take on the Balmain-Ryde Tigers with kick-off at 12pm at ANZ Stadium. | To the NRL Grand Final and NOT The Footy Show delivers a full preview of Canterbury v Melbourne plus we go one on one with former NRL star Luke Patten... so join Warrick Nicolson, Maria Tsialis, Matthew Duncan, Nic McInerney, DC Chapman and Eyes is back for our final show - Episode 128. CBY: B Barba, S Perrett, J Morris, K Inu, J Wright, J Reynolds, K Keating, A Tolman, M Ennis (c), S Kasiano, F Pritchard, J Jackson, G Eastwood. Bench: J Graham, D Finucane, C Payne, D Stagg, D Halatau. MEL: B Slater, S Waqa, D Nielsen, W Chambers, J O'Neill, G Widdop, C Cronk, J Bromwich, C Smith (c), B Norrie, S Manu, R Hoffman, T Lowrie. Bench: R Hinchcliffe, K Proctor, J Lowe, R Fa'aoso, R Kostjasyn, M Fonua, S Vave, A Quinn. 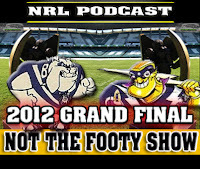 The reasons for the Dogs and Storm winning this Grand Final are well documented in our Podcast - so do yourself a favour and have a listen. In short - the start is where the Dogs can lose the game... but having said that - Melbourne aren't the all conquering team they once were, if they have to chase points late I'm not sold they are up to that challenge, Big 3 or not. And the other crucial factor is the Dogs getting away with slowing Melbourne's play the ball... the reason Melbourne grind teams out of games is they play the ball super quick and slow the game down in defence... up to the Dogs to convince Tony Archer and Ben Cummins that they aren't doing anything more than the Storm on GF day. Gee the Dogs could win this, but I have to pick Melbourne. Both teams can hang on in a game, so this shouldn't be completely decided until the final 10 minutes... go with Melbourne though, by 4 points.